Bamboo, classified as a grass, grows in abundance in Indonesia – particularly so on the island of Java. It has many purposes and supports many livelihoods ranging from traditional use such as food (age less than one month) – handicrafts like basketry (age 6-9 months) – instrument as in bamboo tattoo or flute – laminations (age 2-3 years) to furniture, construction for scaffolding and garden products such as fences and trellis (age 3-6 years). Bamboo textiles are gaining in popularity as well. Bamboo is officially classified as a grass and some species can grow up to 30+ cm per day; in short bamboo is a marvelous gift from nature! Bamboo is a sustainable resource when harvested in a proper manner and grows practically everywhere from mountainous areas to sawa’s and forests. Traditionally bamboo has been harvested in accordance with the moon calendar claiming more sweetness when full or with a new moon and was treated in rivers for bugs for lengthly times. There after it was sundried to become a sturdy resource for construction or furniture. Nowadays and for commercial purposes that process has been sped up by the use of chemicals whereas sun drying for 10 – 12 days is still a better option compared to solar or fossil fueled ovens. 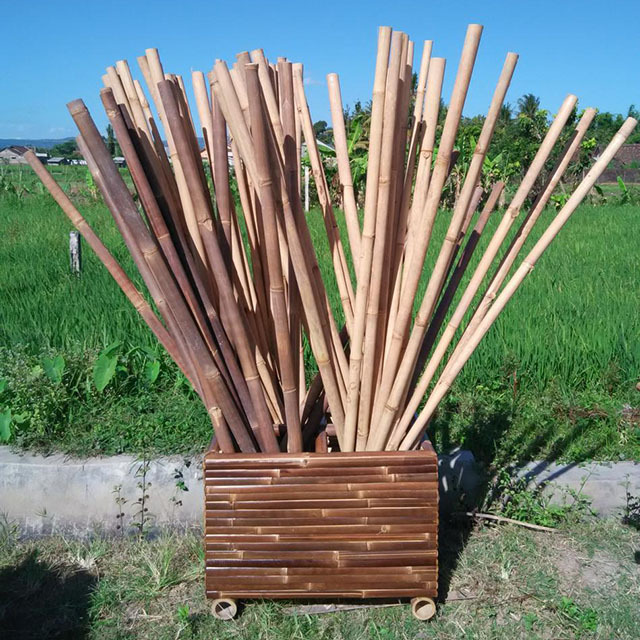 The drying of our bamboo takes place in the sunny and wind swept sawa’s around Yogyakarta, whereas we do support solar and fossil fuelled methods throughout the rainy season to meet demand of bamboo supplies. PT Bamboo Craft Indonesia (a.k.a. 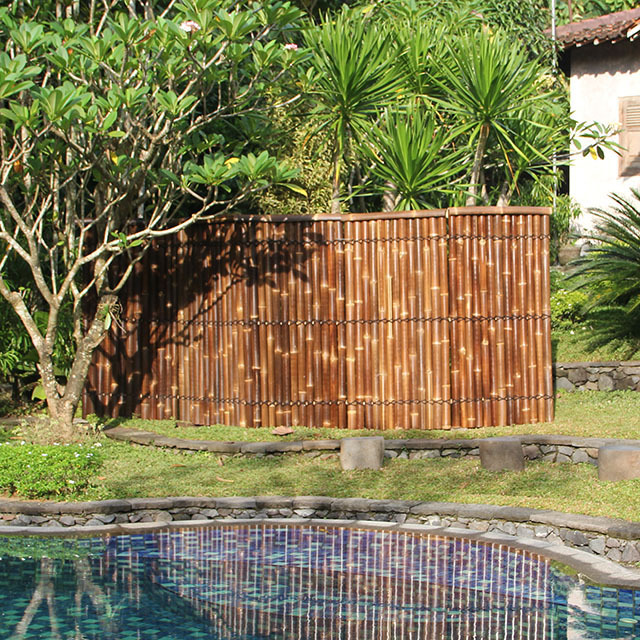 CV Bamboo Indonesia) produces bamboo garden fence & border products and is based in Jogjakarta – the capital of bamboo in Indonesia. We produce bamboo fence panels like bamboo roll fences – traditional one sided bamboo half raft fences – double sided bamboo full raft fencing and bamboo split fencing. A substantial part of our activities is the delivery of bamboo for festivals around the world. Our other bamboo products are bamboo poles – bamboo gazebos – bamboo crafts – bamboo garden stakes bamboo lattice & lath as well as borders. 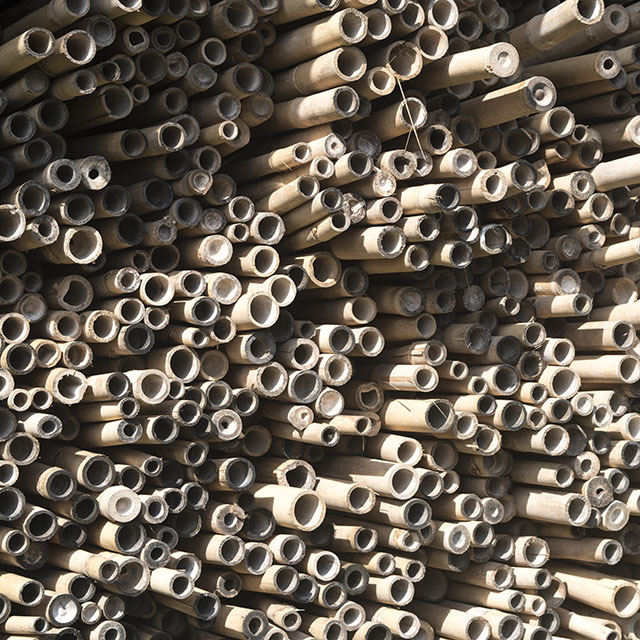 Our bamboo products are sundried throughout most of the year – whereas we have 3 large fossil fueled kilns to assist the bamboo drying process during the rainy season. All our bamboo products are treated for bugs and mildew.